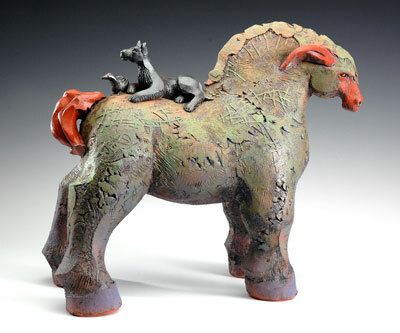 Dina Wilde-Ramsing has been a potter for 25 years. 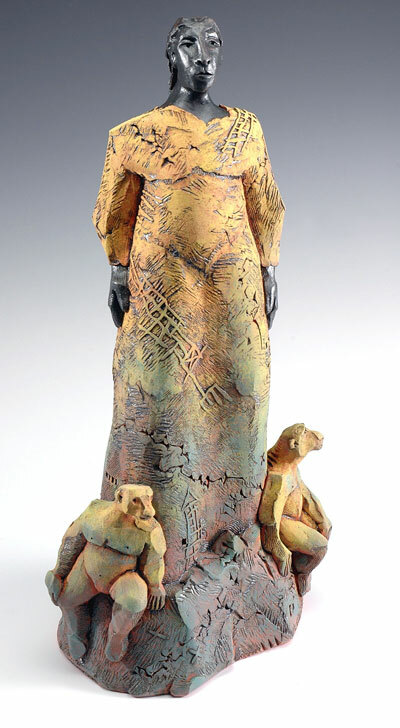 She takes great pleasure in being tied to the long stretch of historic, artistic tradition which clay represents. She considers the content of her most serious work to be narrative, figurative, and personally symbolic in a way that will establish an intimate connection between herself and the viewer. Animal imagery in her work is meant to convey emotions of comfort and support, forces which we as humans seek to shelter and "transport" us through the journeys we must travel. She feels that her work appeals more to the senses than to the intellect. A consistent, recognizable element in her body of work is the effort to invoke the aesthetic and emotional impact of artifacts from unfamiliar cultures. Archeological artifacts are ingenuous, unrefined, mysterious, and their content is sometimes unknowable. The emotion they elicit connects us to a long and wide stretch of human artistic tradition. Although her work is unmistakably contemporary in design, it carries the influences of geology, archeology and history.